We specialize in Rehabilitation Home Care programs and Private Home Care solutions. We carefully match our network of experts and associates with each client. Every aspect of care is personalized and supported by our long-standing commitment to dependability and trust. Michigan's Most Trusted Home Healthcare Provider. Our team management approach allows us to work closely with case managers, trusted family advisors and all rehabilitation therapies including occupational, physical, speech, social work, and nutrition. Our approach is totally comprehensive and custom-tailored care for each individual we serve. Health Partners invests deeply in a rich and rewarding employment experience for all of our caregivers. Clients and families can count on the best, most dependable care knowing that our providers are committed employees who have a long-term perspective and take personal pride in our mission of helping clients reach their maximum level of functioning and independence and to improve their psychological and social well-being. 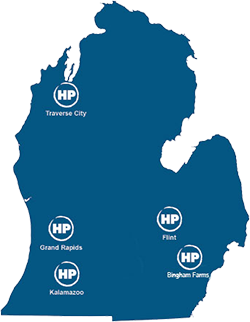 Health Partners works hard as a consumer advocate to protect against attempts by insurance companies to reduce the coverage available under Michigan Auto No-Fault insurance law. In fact, we’re so passionate about this system that we are one of the founding members of the NeuroTrauma Association, an advocacy organization with the singular goal of spreading the lifetime coverage model to other states. A complete benefit package, consistent support, and a comprehensive education package. Health Partners hires RNs, LPNs, and HHA as well as family members to staff our homecare private duty cases. We offer a complete benefit package consisting of Medical, Dental and Vision Insurance, Guarantee Issue Life Insurance, 401K and Employee Assistance Program (EAP).